Iraq's parliament has agreed to extend the deadline for finalising the country's draft constitution after delegates failed to reach agreement. MPs agreed to give the committee until 22 August to resolve the disputes. 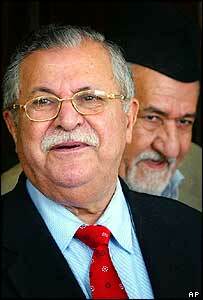 Delegates from Iraq's ethnic groups have been split over issues including federalism for Kurds and Shias. US President George W Bush downplayed the delay and praised the "heroic efforts" made by Iraqi politicians to reach an agreement on the charter. The speaker of the Iraqi parliament told members that negotiators had agreed on many topics, but a final agreement still had not been reached. As well as the question of a federal structure for Iraq, other key issues are the role of Muslim clerics and the place of Islam in law-making. Just 20 minutes before the midnight deadline to present the new constitution expired, lawmakers reached the three-quarters majority needed for an extension. "It was no disappointment, because we have done a lot," Iraqi President Jalal Talabani said, adding that the delay would not "shake the confidence" of the Iraqi people. "It must be carefully drafted to avoid mistakes in the future." Iraqi Prime Minister Ibrahim al-Jaafari shared the view. "We should not be hasty regarding the issues and the constitution should not be born crippled," he said after the parliament session, which lasted only 15 minutes. "We are keen to have an early constitution, but the constitution should be completed in all of its items," he added. It is now hoped that an agreement can be reached shortly. Mr Bush, who is currently on holiday at his Texas ranch, said in a statement the politicians would carry on working "to refine the text and build an enduring consensus". "I applaud the heroic efforts of Iraqi negotiators and appreciate their work to resolve remaining issues through continued negotiation and dialogue," he said. "Their efforts are a tribute to democracy and an example that difficult problems can be solved peacefully through debate, negotiation and compromise." The constitution needs to be approved by the National Assembly before it can go to a nationwide referendum in October. Kurdish minister Barhem Saleh told al-Arabiya TV that if no agreement could be reached on the constitution, the National Assembly would have to be dissolved and fresh elections held. 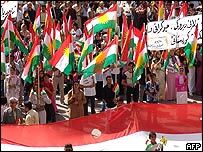 The Shia Muslims and Kurds between them have a parliamentary majority which could see the document passed. But this has raised concerns that the constitution could alienate the Sunni minority further and could create a backlash when the referendum is held. Before parliament met, Saleh Mutlaq, a Sunni Muslim member of the panel drafting the constitution, said Sunnis would reject the draft if it contained proposals for a federal Iraq. Kurdish and Shia members have reportedly dropped demands that the country should be called federal or Islamic, and agreed that the official name should be the Republic of Iraq. But any devolution of power, beyond the existing autonomy enjoyed by Kurds, remains contentious. Sunni Muslims have been incensed by a call from leading Shia politician Abdul Aziz al-Hakim for an autonomous region in the oil-rich south. Iraq's oil minister has promised that the new constitution will ensure the fair distribution of lucrative oil revenues. Police find 30 bodies, two of them women, in a mass grave south of Baghdad.